Organize your cookware and save cabinet space with the Copper Motif Oval Hanging Pot Rack by Range Kleen. 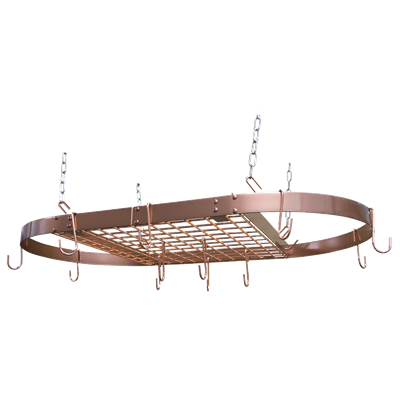 The ceiling mounted Oval Hanging Pot Rack Bar features a stylish Copper painted finish, and is perfect for utilizing unconventional spaces for organizing. Your cookware will be within reach and your cabinets will have additional storage space. Full assembly instructions included for the Range Kleen #CW6015 Pot Rack. Range Kleen Mfg., Inc. warrants pot racks to be free from defects in workmanship and materials under normal household use to the original purchaser for 5 years from the date of original purchase. To maintain your pot rack, we recommend that you follow the Use and Care instructions carefully.